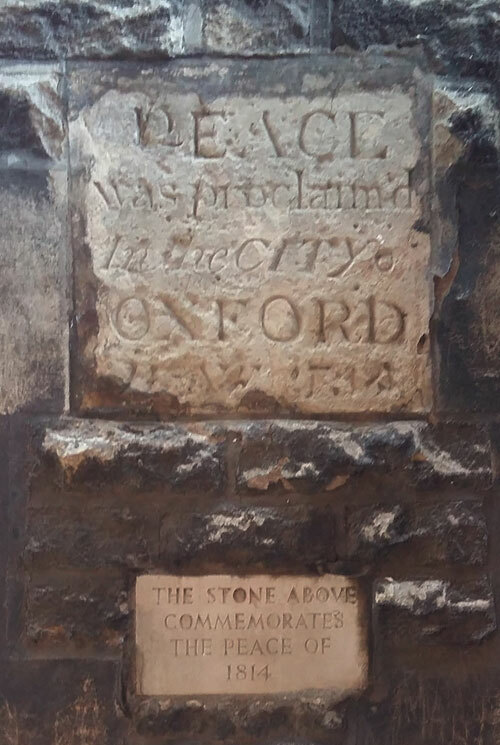 In 1814 this peace stone was set in the north side of the tower of the original medieval Church of St Martin at Carfax. This church was in the centre of the City of Oxford where four roads meet, and it was also the City Church. The medieval church of St Martin became unsafe in 1820 and was demolished except for its thirteenth-century west tower; and the church that replaced it was in turn demolished in 1896: again the medieval tower with this peace stone on its north outside wall survived.